As a convenient satellite validated tool, the technical index has surpassed the mid-range Digital Satellite Searcher. Support language: English, French, Farsi, Russian, Arabic, Portuguese, Turkish. 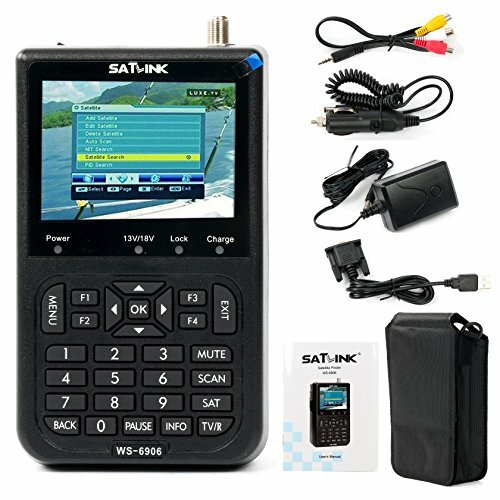 1.WS-6906 Satellite Signal Finder Meter is only used for satellite signal strength measuring. The strength of the satellite signal is depended on the area you are in instead of our WS-6906 Satellite Signal Finder Meter.Besides, WS-6906 Satellite Signal Finder Meter is only used for free satellite signal finder and SD TV signal finder. 2.If you have issues when using WS-6906 Satellite Signal Finder Meter, such as it doesn't work, pls don't hesitate to contact us via E-mail, we will provide you excellent in-line service to solve the problems. Your satisfaction is our goal. 3.WS-6906 is not capable for dish hybird system，dishnetwork satellites，directv SWM dish, and analog signal.